We are starting to publish the sim/region-related set of HTTP API functions. These functions allow restarting regions, returning objects, ejecting/banning residents. The first function which is available already is simrestart. 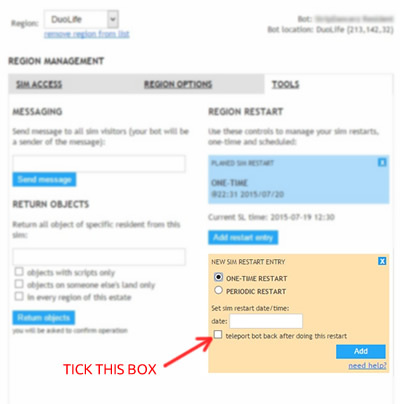 The function allows initiating the region restart (and canceling the procedure, too). P.S. These API functions does not require a Sim Governor addon-module. P.P.S. 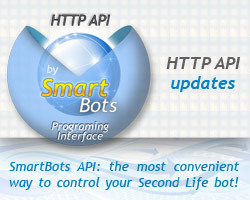 We’ve added a shorthand LSL function to call SmartBots API. While API is easily accessible in a raw way, using a function may be extremely handy. 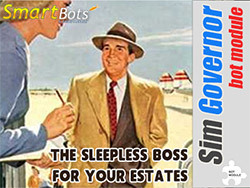 Visit your bot’s sim governor page. Select the sim you wish to change. Tick the ‘Teleport bot back after doing this restart’ box. 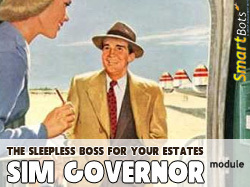 Tags: governor, home, sim, teleport, we fixed it!